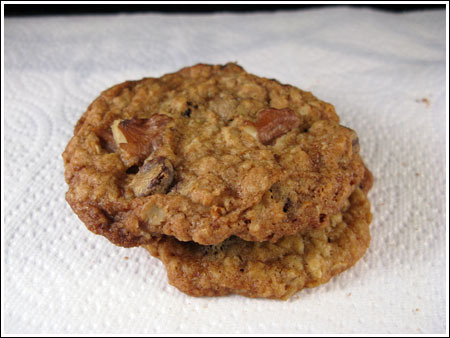 I liked the Friendly Kitchen cookies a lot because they were a little thicker, denser and less sweet. They’d be great with coconut, but I left it out this time. Cream the butter and the sugars with an electric mixer until light. Beat in the egg, then the milk and the vanilla extract. Stir the flour, baking soda and salt together and gradually stir the flour mixture into the sugar mixture until it’s incorporated. Stir in the oats chocolate chips and coconut (if using). Drop dough, making 1 inch rounds, onto the cookie sheet, placing about 1 1/2 inches apart so they have room to spread. Bake on center rack for 10 minutes, until golden brown at the edges and light golden at the center. Made these today and liked them a lot!! I like that they’re a little less sweet than the Frog Commissary cookies. But I have to say I liked those quite a lot too. I made a half batch of these yesterday for a dinner party, and the one egg I was supposed to add had two yolks in it! So creepy. But the cookies were delicious even with the extra yolk. I added about a third cup of dried goji berries too, and they were a hit. Forget to mention, I also accidentally put the first tray in the oven without adding chocolate chips. I added them to the rest of the batter – but the coconut ones especially are also really, really good without the chips. I split the wet and dry ingredients in half, and added coconut to one half and a chai spice mix to the other half. The spice half needed more flour, not sure how much I used – less than 1/4 cup, I think. The coconut batch came out thicker, the spice half spread a bit but still thick and hearty. I can taste the coconut even more today (yes, I had one for breakfast :-)). Great cookies, great texture! Hey, I guess my sugar tweak leans a little towards the Frog’s Commissary recipe, so maybe mine are “Friendly Frog Cookies”? Ooo, I can’t wait to try these with the coconut. These cookies look thick and delicious. I love that they’ve got such wonderful textures going on. Man oh man, you’re making me crave some cookies!